The Virginia Law Enforcement Professional Standards Commission was established in 1993, and tasked with creating an accreditation opportunity specific to Virginia law enforcement. Since that time, the Commission has overseen the development of a comprehensive, efficient, and viable process that can assist Virginia’s law enforcement community in the development and certification of policy and procedure. The accreditation process is not mandatory and only 92 out of 417 agencies in the state of Virginia hold that honor. The mission of the Virginia Law Enforcement Professional Standards Commission is to advance law enforcement professionalism through the establishment of professional standards and the administration of a formal mechanism by which Virginia agencies can be systematically measured, evaluated, and updated. The Commission goals include: To increase the effectiveness and efficiency of law enforcement agencies in the Commonwealth of Virginia in the delivery of services. To promote cooperation and coordination among all components in the criminal justice system. To ensure the appropriate level of training for law enforcement personnel. To promote public confidence in law enforcement. And to promote the professionalism of law enforcement agencies in the Commonwealth of Virginia. Being an accredited agency is an ongoing program for the Charlotte County Sheriff’s Office that began in January 2005. The Virginia Law Enforcement Standards Commission sets forth the highest of standards to be followed. Even though the terms run four years, proper documentation and inspections are done and accounted for on a yearly basis. There are 190 Standards, which include Administration with 242 proofs, Operations with 268 proofs, Personnel with 86 proofs and Training with 24 proofs totaling 2,480 proofs for a four-year term. The proofs and documentation used came from the day-to-day activities and operations of the jail/dispatch staff, the road staff, the tactical team, investigations, evidence custodians, school resource officers and supervisors. A Certificate of Accreditation from the Virginia Law Enforcement Professional Standards Commission was presented to Charlotte County Sheriff Thomas D. Jones and his department at the Charlotte County Board of Supervisors meeting Tuesday April 14, 2015. 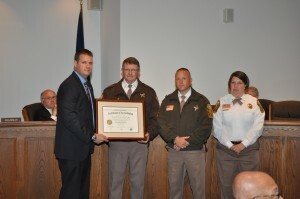 This certificate was to honor the second reaccreditation for the Sheriff’s Office. The Sheriff’s Office received their initial accreditation in January of 2007 and their first reaccreditation in January of 2011.